Looking outside recently, I was amazed at the picture. A fluffy white landscape, powder covering every surface, sunshine streaming through ice crystals on the trees, and a crisp cobalt sky. Isn’t God amazing? 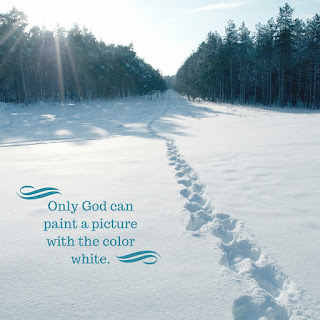 Only he can paint a picture with the color white. Take nothing and make it something. It is truly inspiring. I find that I am often inspired by His nature. Winter. It is the season where all that death is covered with a blanket of white. Cleansing. A place for a fresh start. Beauty in it’s simplicity. This is the picture that caught my eye this morning. It was like standing in the middle of God’s grace. And the entire time we’re admiring it, something new is taking place. Life is getting ready to break forth. Spring. It’s name says it all. Life is springing up new around us in brilliant bursts of color. Sounds explode as everything comes alive, singing God’s praises, showing it. He's doing a new work in us. Making all things new again. “See, I am doing a new thing! Now it springs up…” (Isaiah 43:18) And He doesn’t just stop there with life beginning. He shines the son on it, grows it, deepens its roots so it can thrive. Summer. Life in full swing. Days full of light and warmth. Productivity. Beauty. Hardly any night. It is an amazing place to be. One we wish could last forever, and someday will. So when life is buzzing around you, when you feel overwhelmed, just stop. Look around you at the painting God has placed you in. See the reminders He’s given you that you are not alone. That time keeps moving forward. Daybreak comes. Life springs forth again. It can't help but have to. It's God's nature.